Mathilda had a slight relapse on Thursday. Hubby was doing evening chores. She was fine – or at least status quo. He came down to the house. Five minutes later, he was back at the barn and she was unwilling to put weight on her bad leg. No idea what happened. We agree she took a funny step. He thinks she was fussing due to the storm. I chose to look at it as a good sign. When I’m really sick, I’m easy to deal with. Just put me to bed or shoot me. I don’t care which. When I start to recover, I get cranky & restless. I think she’s getting tired of standing in her gilded cage. Doubled her dosage last night & she is much better. Today (Friday) I’ve been taking her out on several short grazes in place of two long ones and two quick carrot checks. Same number of trips to the barn, just reallocating the time. So, no substantive change in activity. The psychic toll, however, we do not need. And now for something completely different. 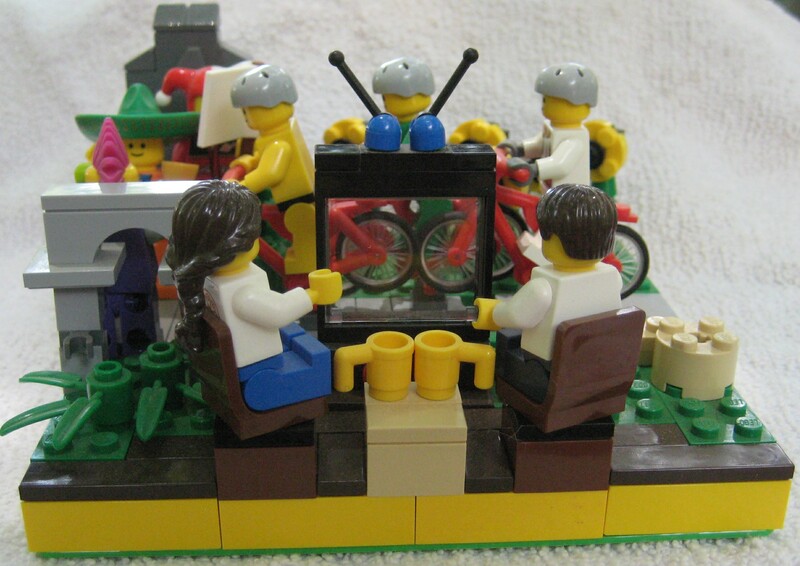 At our house, we spend July celebrating athleticism by sitting on our butts watching the Tour de France bike race. The intermediate sprints are marked with a green banner bearing the PMU logo and a horse head, video. It stands for Pari Mutuel Urbain, a French betting concern. A recent PMU entry into the insanity that is the publicity caravan. Excellent LEGO but where are the cats?